As I’m sure you know, Melly founded The ROUS Foundation for Capybara Veterinary Medicine in memory of Caplin Rous. What better way to celebrate his birthday than to contribute to his foundation? There are a lot of ways to donate, depending on what you want to do. Firstly, if you want to make a tax deductible donation follow this link. That takes you directly to the Texas A&M ROUS Fund. Melly won’t be able to see what you donate there but she will still appreciate it. Send us an email at CaplinRous at gmail dot com so we’ll know. Another thing you can do is to buy some of the Caplin Rous puzzles, we still have plenty left. I have to tell you that we will not be making any more puzzles once these are gone. They haven’t sold as quickly as we had hoped. I guess people just don’t like puzzles or they don’t like the particular puzzles that Melly had made even though we love them and have had hours of fun putting ours together. The last thing you can do is to donate using Melly’s PayPal . This is not tax deductible. Melly uses some of the money to make new things to sell to make more money for the Foundation. For instance, we are planning on making shirts and caps with the ROUS Foundation logo on them and then selling them on our site. So some of the money is used to make more money but eventually all the money goes to the Foundation. In case you are wondering, Melly gave the Foundation $2500 as starter money and that all came from donations and sales. Everyone who donates gets a surprise gift! That includes people who donated by buying puzzles and people who donate to Texas A&M as long as they are sure to tell me. I’m not going to tell you what all the gifts are but I’ll let you see one possible gift. Some lucky people are going to get one of these great raku tiles made by Francine Rossi. Francine is providing these tiles to the Foundation for free because she misses Caplin Rous and doesn’t want anything bad to happen to me. Here’s a little introduction from Francine and an explanation of how she makes the tiles. Capys! 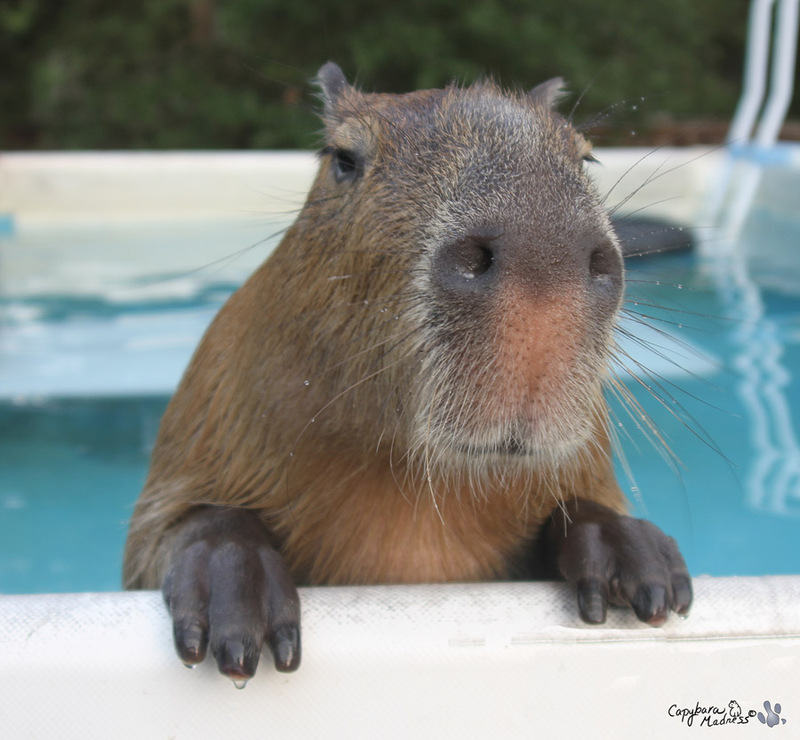 I have always adored capybaras…they look like giant guinea pigs! I am a former cavyslave, and a fan of order rodentia in general. If there are capys on TV, I stop and watch. Imagine my amazement when tuned in to Animal Planet and saw a trailer for a PET CAPYBARA! My jaw dropped, and I was pretty much agog for the entire sequence. Like, moths could have flown into my mouth. I tried to share my excitement with grey parrot Jed, but he was unimpressed. I sure was! I dashed to the interwebs, subscribed to gianthamster, found Caplin on the Facebook, then Dobby and Stacy, sweet Penelope, and so on. 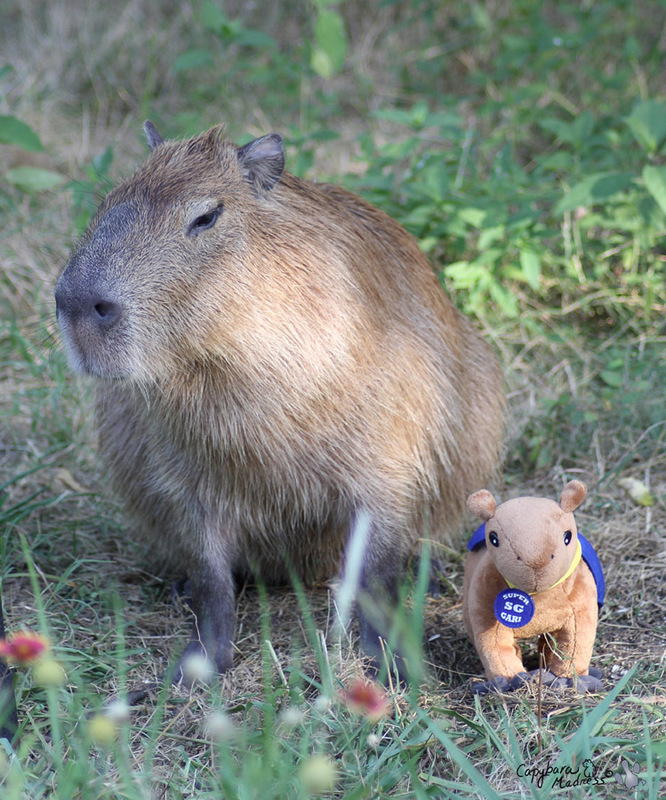 EVERYONE had a capybara! My friends were kindly tolerant of my excitement. I flooded them with links and pictures, and won some over into capy fandom. Raku is the whole reason I got into ceramics! Fire good, fire pretty! We have trash cans full of dead leaves, pine needles, shredded paper, whatever combustible we have at the time. Fired bisque is heated up–glazed, partialy glazed, with some metal oxide on it, whatever–and the red hot pieces are placed inside the cans. Once the flames start in, another handful of paper is dumped on top, and the can is shut tight and allowed to smoke for half an hour or so. The reduction fire changes the glazes, causing crackle and metallilc effects. The smoke carbonizes the unglazed parts of the clay. You Never Know what will happen when the bucket is opened. Generally the results are fabulous. Sometimes they are amazingly hideous. No matter what, you will not be able to replicate what happened, even with the same glaze. Remember, every one of the tiles is different and they are in limited supply. One last thing: the Super Gari plush prototype came! Only Melly is not in love with it. She says it will need another round of modifications, something about me having a big head. Since we’re doing another round of prototypes, it’s going to be a while before Super Gari is ready. I would love to hear feedback on what you think of him so far though. I never knew I was getting so big until I saw me next to my plushie. Guess I should have worn my medallion. Help us make this donation drive a success! 13 comments to The ROUS Foundation Needs YOU! I am actually liking the superGari…how about some more pics? His head didn’t seem oddly large to me. Francine, the raku tiles are fantastic! I like Super Gari, too! Let’s see some more angles! That was very wonderful of you Francine! I too see nothing wrong w/new plushie! 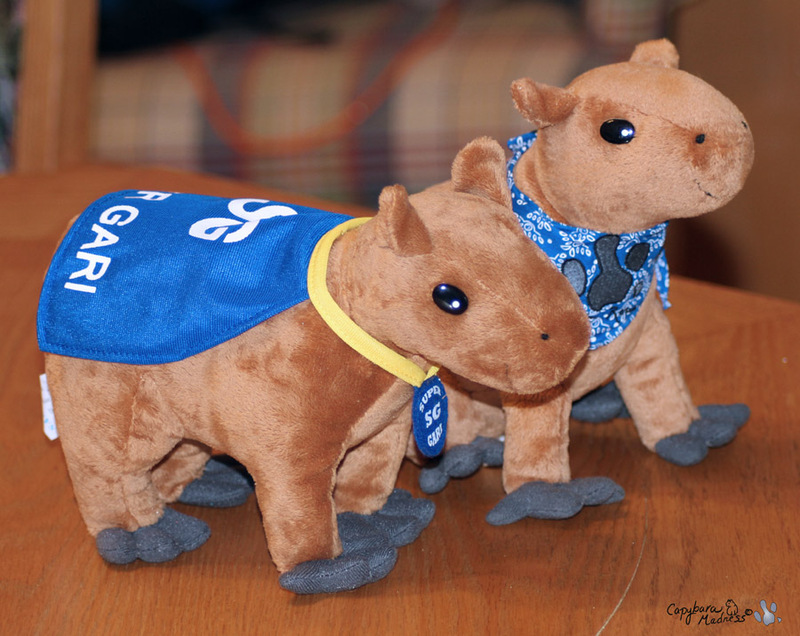 I like the looks of the new super Gari… I bought a Capy Copy and I think they’d look good together! I’d definitely buy a super Gari! I have been meaning to clear off some space and buy some of those puzzles to do. I also will get a Super Gari to keep my Capycopy company! Aw, we love our Caplin puzzle and our Capycoppy! I can’t believe the puzzles have not sold fast enough. What’s not to love? We had so much fun doing ours and were even featured in the puzzle blog. Love these tiles by Francine, she is very talented! Oh Francine…I love the tiles. So when do they go up for sale? Melanie,-how to send a donation towards the Rous Foundation ??? Has the Rous Foundation also a “Pay Pal account” ??? And : what kind of CAPLIN puzzles are left-over ? What kind of photo and how many puzzle pieces and at least the price(s) of them ! Would be great if you send me an answer !! and to CORAL,who spends much time with GARI as well !!! I`ll think on CAPLIN on 10th of July ! I think all of that information is in the post if you follow the various links, or basically just follow the link to http://www.CaplinRous.com. I just ordered two puzzles. I really wanted the 672 piece one with Caplin reading the paper, but the window doesn’t open up far enough for me to click on the “buy now” button for item J, so I wound up ordering the 108 piece one. Is there a way to change it to the 672-piece one and pay the difference? we looove Gari, Melly & the rest of the ROUS CREW. And all of us want the Foundation to succeed, don’t we? So, c’mon folks. Dig deep. Forget that Starbucks trip and donate the money to the ROUS Foundation. You’ll feel better. I know I did!! !